Murray finally got on the scoreboard and also broke Ferrer. However, the Spaniard broke Murray a third time in the initial set to close it out. The second seed had multiple break chances to take the ascendancy in the opening set, but the miscues outnumbered the winners. 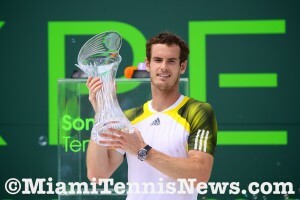 Murray’s hold on a ninth Masters 1000 trophy looked in jeopardy. As Ferrer double faulted in the third game of the second set, Murray had double break point. The Brit converted when Ferrer’s forehand up the line landed wide. Murray went on to consolidate for 3-1. In the seventh game, with gritty defense, Ferrer salvaged two break points and guarded serve for 3-4. With a myriad of mistakes, Murray permitted Ferrer to manufacture break point. With Murray’s attempted dropshot going array, Ferrer knotted the set. But, with backhand upon backhand errors, Ferrer donated a game to Murray for 5-4. Murray wrapped up the next game to send the match into a final set. A slew of breaks ensued in the third set, with neither player holding the first six games. Finally, Ferrer held for 4-3. At that point, the Spaniard was suffering physically, requiring medical attention to his left thigh. Despite feeling the effects of the heat, Murray pushed forth. After maintaining serve, Murray forced an error from Ferrer with a deep return to get break point. With Ferrer dumping a forehand into the net, Murray had the crucial break for 5-4. Subsequent to a second rub down of the thigh, Ferrer got another jolt of adrenaline. With Murray serving for the championship, Ferrer struck an overhead winner for double break point. He converted as Murray dumped a forehand into the bottom of the net. Following a relatively comfortable hold for 6-5, Ferrer had championship point when Murray’s backhand volley sailed wide. However, on the next stroke, Ferrer stopped play believing the ball was long. Unfortunately for the Spaniard, the challenge revealed Murray’s ball grazed the line. Ultimately, Murray won the game and the tiebreaker was instituted only for the third time in a Miami final. Murray jumped to a 4-0 advantage as a physically spent Ferrer hobbled and misfired from both wings. Murray easily claimed the tiebreaker, his second Sony Open trophy, the world number two ranking and his ninth Masters 1000 title. The toll of the match on both players is apparent from the count of 14 winners, 50 unforced errors for Ferrer and 23 winners, 45 unforced errors for Murray. Ferrer grabbed 8 of 14 break points while Murray 7 of 15. A definite heartbreaker for Ferrer “one point” was his reaction. Still, Ferrer does not regret challenging “it was a very close match. I had my chance on match point. I saw it out. The final set I was more tired than him and he deserved to win”. Although Ferrer is one of the fittest players on tour, the weather and the previous two matches which went the distance may have caught up with him “it was very hot. It was very tough. With Andy it was a very physical match. . .today was hotter than the other days”. Four all in the second set was a pivotal juncture, Ferrer agreed “it was a very important game. I played a very bad game. . . [but] in the third set I was a break down three times. I had 6-5 and match point. I had my chance. I did not take advantage. . . With these players, if I don’t take advantage, it’s impossible to win”. Despite the result, Ferrer feels honored to have been in the Miami final “with tomorrow, I’m going to be positive. I did final. . . the support of the people, to see a lot of Spanish fans, I only have words of thanks”. Ferrer once again will climb back to number four in the rankings, displacing his countryman Nadal. Love down. That was tough. . .he started the match pretty well. . .better than me. . the conditions a little bit. There’s always going to be some nerves in the final, as well”. downs, a lot of mistakes from both of us. But I did fight hard, showed good mental strength to get through that match, because it easily could have slipped away from me”. Murray only had praise for Ferrer “we both get on very. I train with him a lot, practice with him all the time. I don’t think he gets the respect that he deserves within the game. He’s been in the top 5 in the world now for at least three years. . .He’s improved his game every single year. That takes a great attitude to be able to do that”. Carlo or Madrid or Rome and [worry or think] about that. . .for me it doesn’t change a huge amount, but the fact that I’m moving up the rankings is a good sign. I have been winning a lot of matches. My consistency has been better over the last few months. The rankings obviously reflect that. So I will try and keep working hard during the clay and hopefully I can go higher”. With that being said, Murray hopes to shoot to the top of the rankings soon. This tournament may have just ushered in the epoch of Novak Djokovic and Andy Murray while closing the curtain on the Roger-Rafa era.